As Larry Cuban referenced in a recent post, the core idea of personalized learning is far from new. For over a century, reformers have been advocating for a more individualized approach to instruction. As he articulates, the current call to action by personalized learning advocates to shift from teacher to student-centered learning environments is the modern take on this viewpoint. Learning environments are tailored to the unique needs of students based upon learner variability. Learner variability research highlights that each student enters our classrooms with unique abilities and life experiences, factors that have measurable impacts on how they learn. It is therefore vital to design for learner variability not as the exception, but as the norm in today’s classrooms. The approach to instructional design considers students’ interests and incorporates learning experiences that are authentic and personally relevant to students’ lives and social contexts. This type of learning not only enhances student engagement, but also provides new opportunities for learning that are often better suited for developing skills such as identifying and solving complex problems embedded in real-world contexts. Students have increasing degrees of agency and are involved as co-designers of their learning experiences. How personalized is it, really, if students do not have a say in the design of their learning experience? Although this will be implemented differently depending upon the learning context, personalized environments should provide students with some degree of control regarding what they learn, when they learn, how they learn, and how they demonstrate understanding. Personal connections and relationships are developed between students, teachers, families and outside networks. Learning is social. We must therefore design personalized learning environments that value and promote the strengthening of these social relationships that can lead to deeper learning experiences. There is also emerging research that highlights the increasing importance of social emotional learning and its impact on students’ lives beyond K-12 schooling. For context, my understanding of personalized learning has been shaped by various experiences and resources. On the research side of things, key resources include Digital Promise Global’s “Making Learning Personal for All” reports, the LEAP Learning Framework, the MAPLE Personalized Learning Framework, Kallick and Zmuda’s “Students at the Center” and the USDOE’s Future Ready Learning Plan and supporting resources. My frame of reference is rooted in my own personal experiences teaching and experimenting with blended learning environments (previous blog here). The last past 3 years have been spent collaborating with educators and school leaders at the Bristol Warren Regional School District and external network including Future Ready Schools and Digital Promise’s League of Innovative Schools. I had the fortunate opportunity to tour Charlotte-Mecklenburg’s schools during the recent Digital Promise League of Innovative Schools (DLPIS) Spring Meeting 2018. 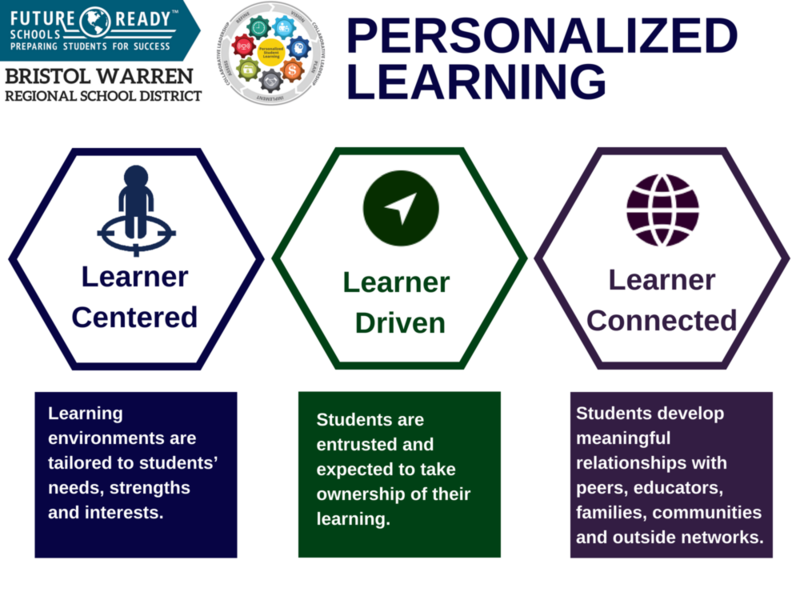 At BWRSD, we have framed personalized learning around three major themes: Learner Centered, Learner Driven, and Learner Connected. [See Graphic Below] Our understanding of personalized learning has gone through multiple iterations over the past three years based upon what we have learned from our Digital Learning Teams’ action research projects as well as feedback from stakeholders in our school community. This is our attempt to frame core elements of personalized learning and apply them to our own context in ways that align with BWRSD’s vision of teaching and learning. For example, some district’s personalized learning initiatives focus primarily on learner-centered approaches that tend to be what some term “hyper individualized instruction.” Although we see some value in those approaches in certain contexts, we recognize that only providing this type of instruction is not what we envision as future ready learning for our students.. We must also devote our personalized learning efforts to the “learner driven” and “learner connected” themes as we believe those are essential to providing students with authentic learning experiences that will truly prepare them for the world beyond K-12 education. Although the four elements that I outlined earlier represent what I believe to be the major areas of convergence across the country around PL, it is important that schools and districts frame the discussion in a way that aligns to the context and vision of their educational setting. As you can see by the BWRSD example, schools and institutions can (and should) focus on the key elements that they deem most relevant and effective for their students. What I caution against is failing to engage in a deeper conversation about what personalized learning actually means to your community. That said, personalized learning does hold tremendous potential to transform instruction, and step one is framing the conversation.